I recently went for a chat with Grace Haskins owner and founder of one of my favourite shops in my home town of Frome. 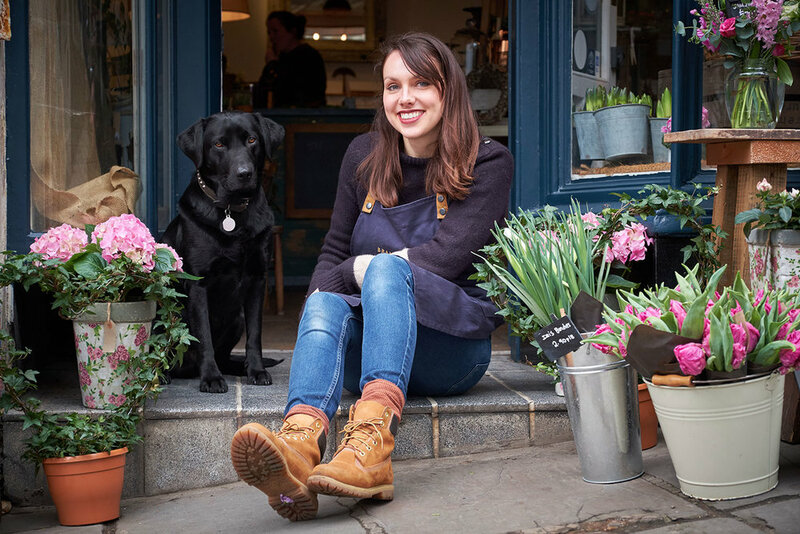 Nestled at the crossroads of Catherine Hill, her beautiful artisan flower shop Bramble & Wild is a beacon of colour and creativity and her dog Bracken is a local celebrity in his own right often seen snoozing on the doorstep. Grace’s artful designs and creative eye have brought her a prolific instagram following and a thriving business. Grace originally set out to be a photographer but had a change of heart whilst on her art foundation course and packed it all in to do a floristry apprenticeship instead. 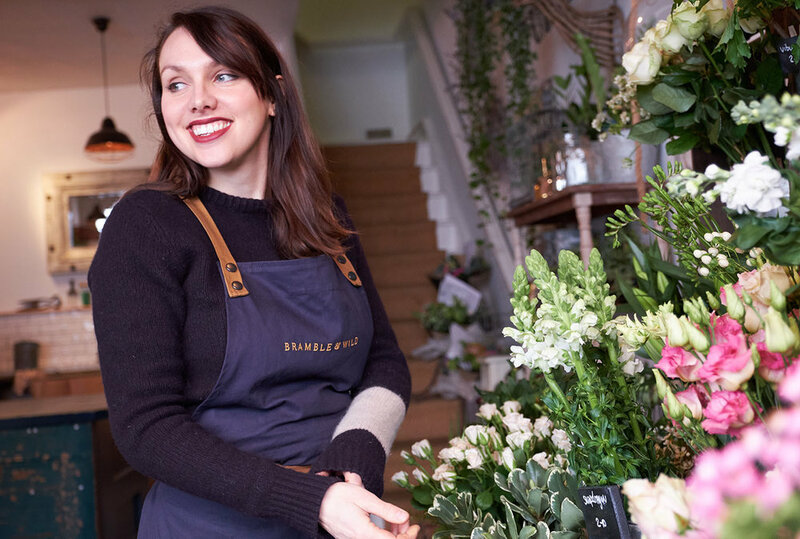 Two years after completing her apprenticeship she opened her shop and she literally hasn’t looked back creating flowers for 65 weddings in her first year! Grace’s sparkling energy and creative flair is evident in her flower arrangements and all around her fabulous shop which is not only full of all sorts of beautiful blooms she also has an eclectic mix of the kinds of gifts you wish someone would buy for you! She describes herself as ‘an in the moment kind of a person’ and this is very much reflected in her work preferring to let things evolve and not be too rigid or standardised about ideas. If she sees something on the day that she hadn’t thought of but feels will work beautifully she will use it. Spontaneity is an important part of her design process. Her favourite thing about wedding flowers is sitting down with the couple and a blank sheet of paper and letting the ideas flow. She says “Its really important to think carefully about your budget. You don’t need to have a massive budget the trick is to be versatile and spend it where people will be lingering for longer. Rather than blowing loads of your budget decorating a staircase you may only walk down for a few seconds, focus on the table centres where people will be sitting for a couple of hours. These can often be transferred to another part of the venue once the dancing starts (This works really well at Orchardleigh where part of the dining room turns into the dance floor). Same with the bouquets, after the ceremony and photos they can easily be popped into a vase and enjoyed around the venue. "I'm always on the look out for new innovations to reduce our carbon footprint like compostable cellophane (currently in development) and instead of foam using moss and chickenwire as much as possible." “I definitely want to continue evolving growing my own flowers. Nobody knows whats happening with Brexit and how that will affect prices. By growing my own it means I can provide more unusual and delicate varieties that don’t travel so well and larger quantities when I need them." Grace’s energy knows no bounds and in a few weeks time she will be designing her own wedding flowers - congratulations Grace we hope you will share some of your creations with us! Here's a little time-lapse showing the Dulcie bouquet being created and Grace's instagram feed @brambleandwild is a must for a little ray of beauty and colour most days. If you're ever in Frome drop by for a sensory overload of beautiful scents and delicate blooms and a warm welcome from Grace and her team and a friendly wag from Bracken too!